Can you see the ring of fire that inspired my title? 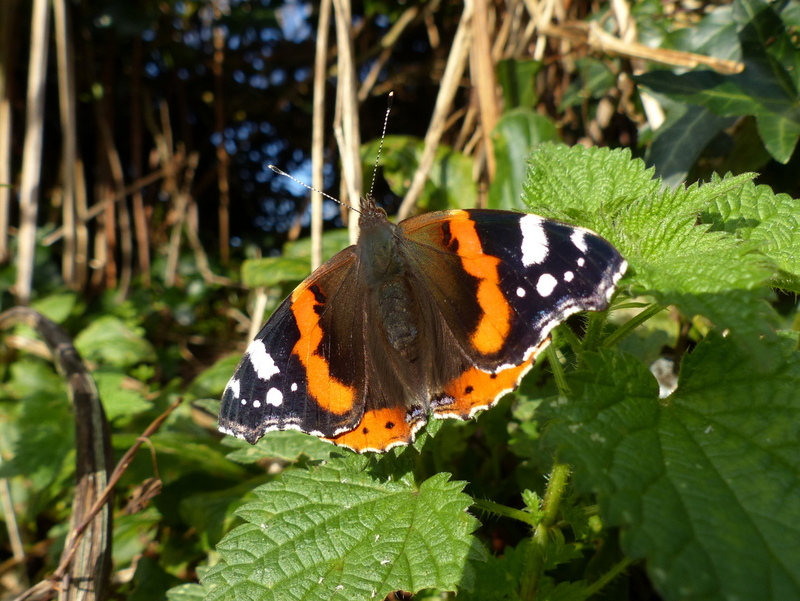 This is my butterfly from a few days back, the first of November. 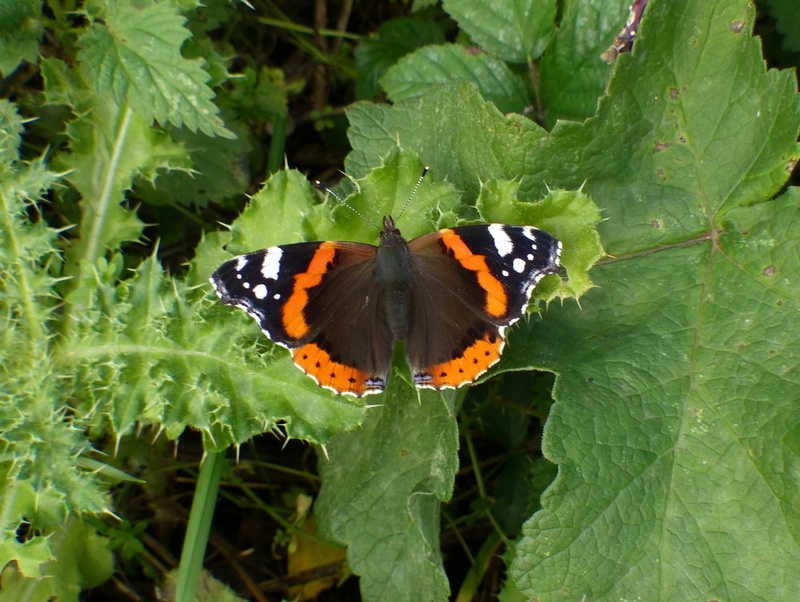 It is a Red Admiral, Vanessa atalanta. 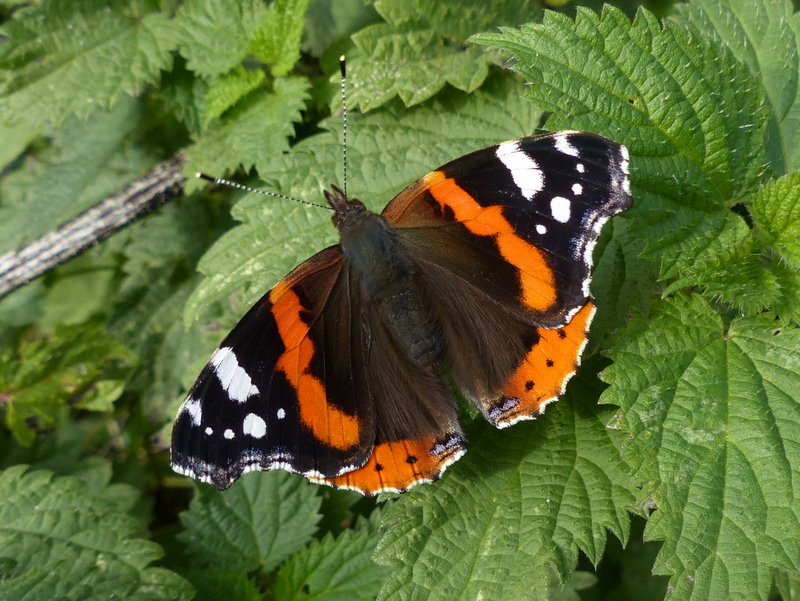 Not really a British butterfly at all it is a summer migrant, flying in from Southern Europe and North Africa in the spring and early summer and returning home in the autumn. Well that is how it used to be. 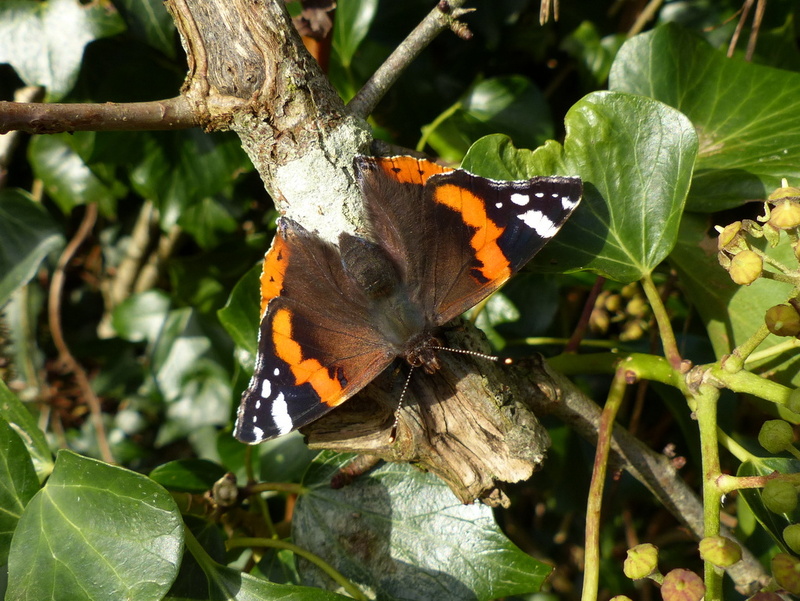 If you Google for the UK Red Admiral you will learn that very rarely it will overwinter in the extreme south of England. Well that is also how it used to be. 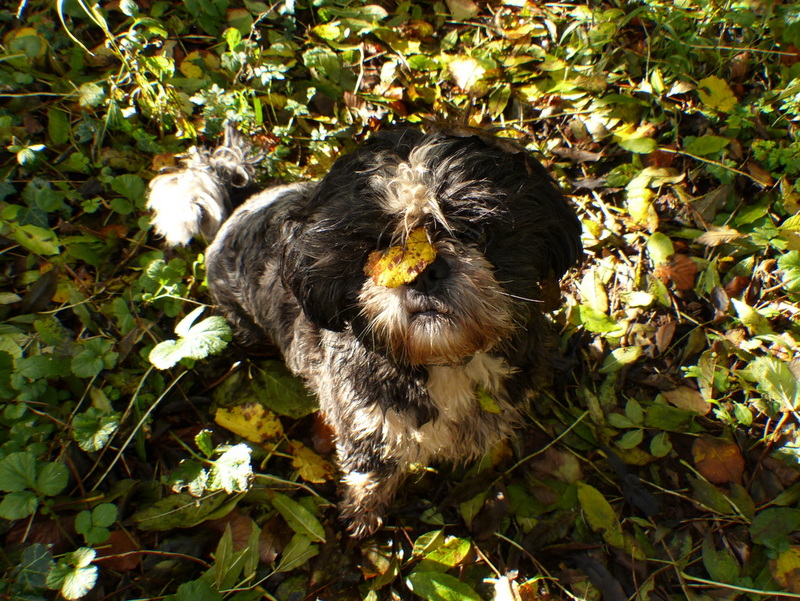 You have got a little something on your nose there. This might turn into a post about climate change. If I asked you for your childhood recollections of October 24th , say from the 1960’s you probably would not remember anything specific but if I changed that date to November the 5th… People in the UK would have no trouble at all recalling that exact day, forty or fifty years ago. It is Bonfire Night. I don’t have any specific memories of my own childhood birthdays but I can recall the excitement of bonfire night fifty years ago. It was a night of duffle coats and scarves and woollen gloves. Sparklers, red faces in the firelight and baked potatoes, it was cold. 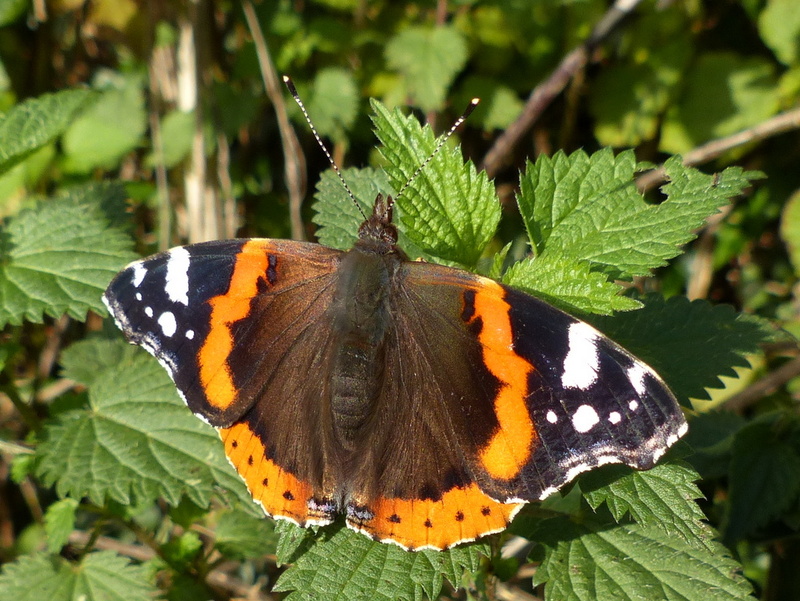 I have just been reading on the RSPB website that Red Admirals can be seen until October and very rarely into November. 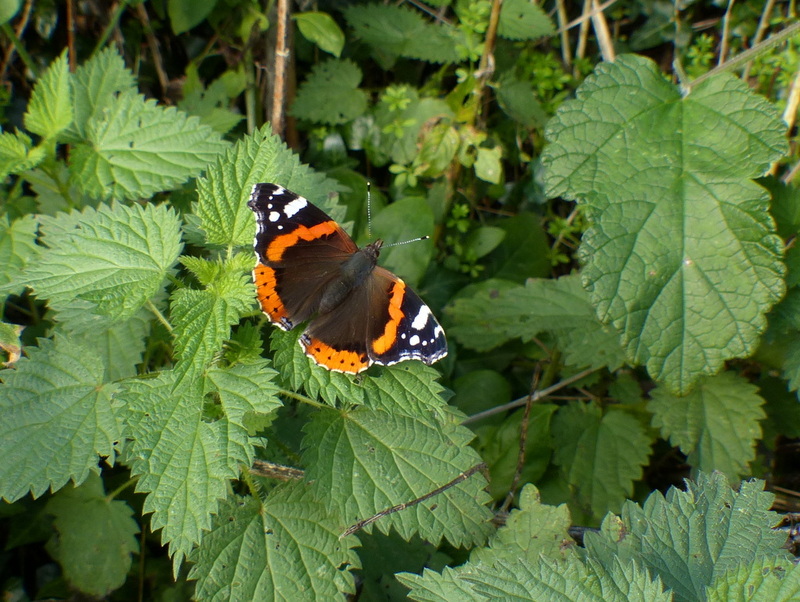 When Fizz and I go out this afternoon if the sun is shining we will see Red Admirals. 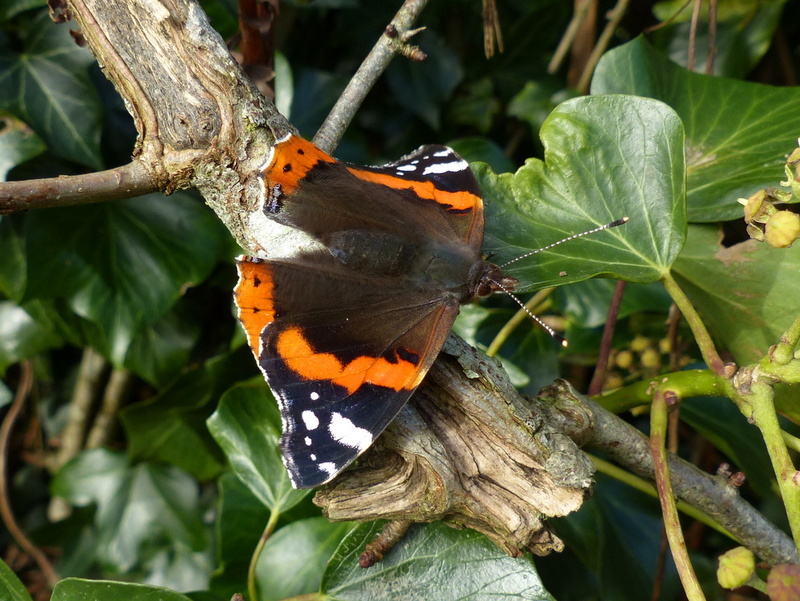 It isn’t rare any more and they will overwinter here in Gloucestershire. Times have changed and winter is warm. 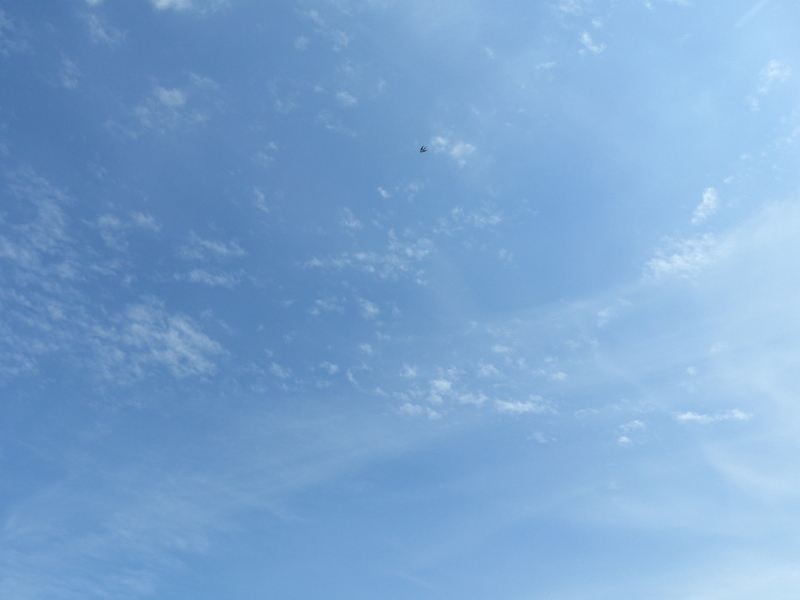 The last few days the weather has been really fantastic here. Well, it has been cold, with lots of sunshine but we have also had sudden downpours of very heavy rain and then hailstones and then more sunshine. It is very lively and I am really enjoying it. It is nice that it is cold enough to wear a coat out and that is useful when the rain comes over but I have not even thought about wearing gloves yet, it isn’t that cold. 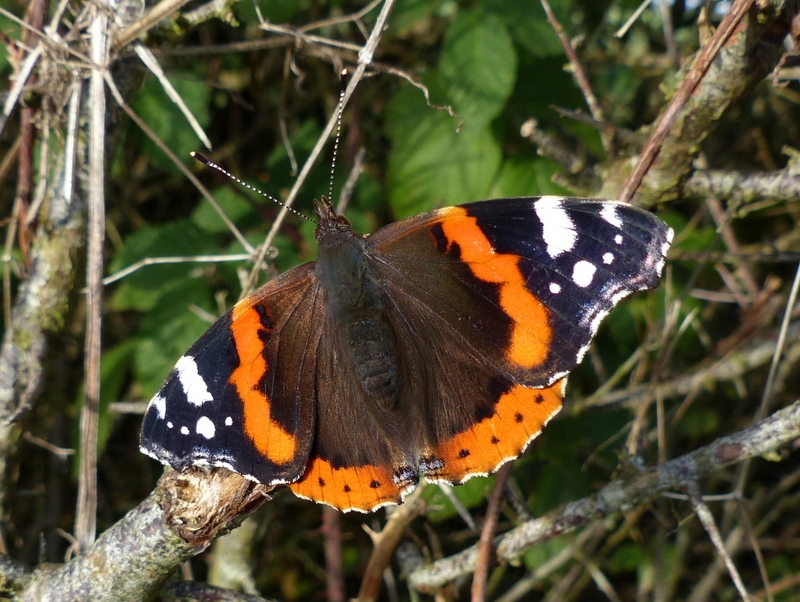 I am going to be keeping a close eye on the insects as we head toward winter. A friend has been asking about Dragonfly sightings. The Migrant Hawker is often seen well into November and I might do a post about that one soon. I would like to see one for myself. There are some really good Dragonfly spots around here but we need a sunny day and I need Fizz to get a clean bill of health. I am pretty sure that she is not in season and a mistake has been made, that is good because I can take her to public places but I need her owner to confirm that and that she is happy for me to take her out. The second dog in this video, Buddy, is a male. Can you see why I don’t think she is in season? There is just nothing in her behaviour to suggest such a thing. 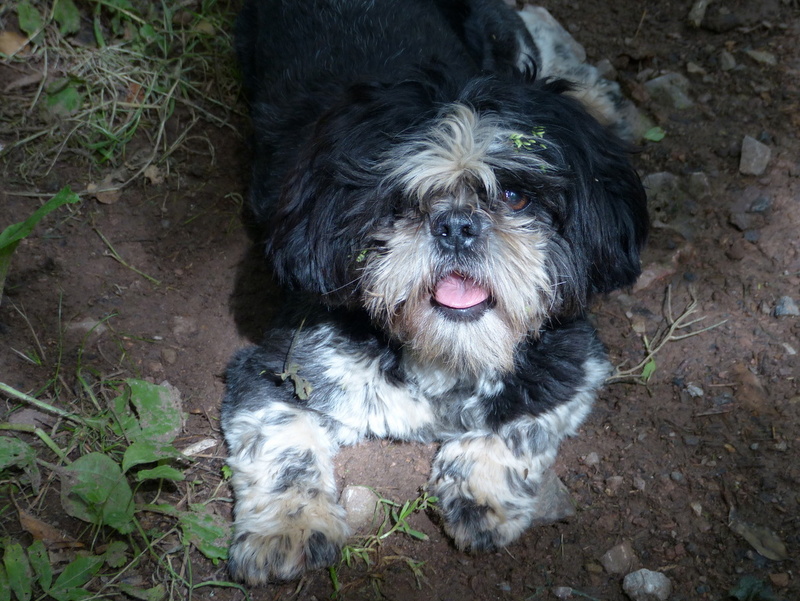 So you sort yourself out and then we can go and look for insects. Okay? I will be around to visit you shortly. Previous PostThe Clouded AgaricNext PostWhat shall we do with the drunken sailor? 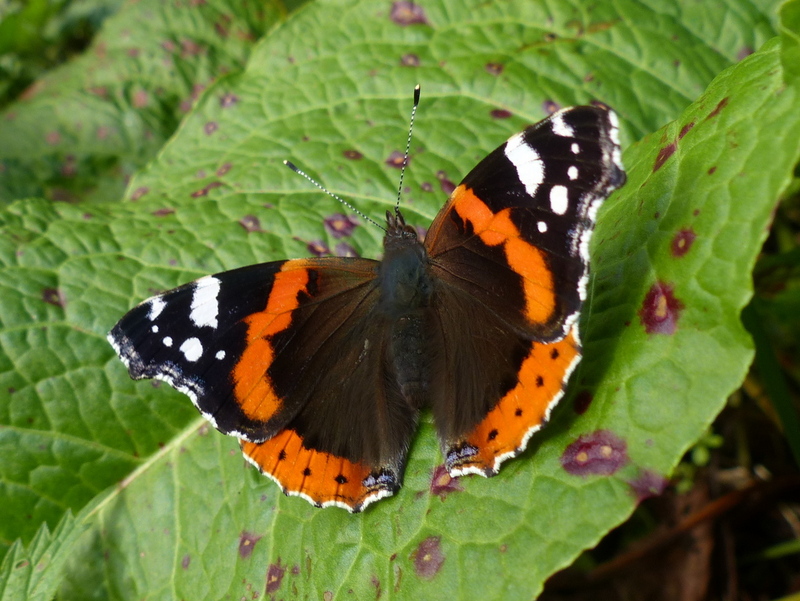 Beautiful images of the Red Admiral – I can see why you like the ‘ring of fire’. 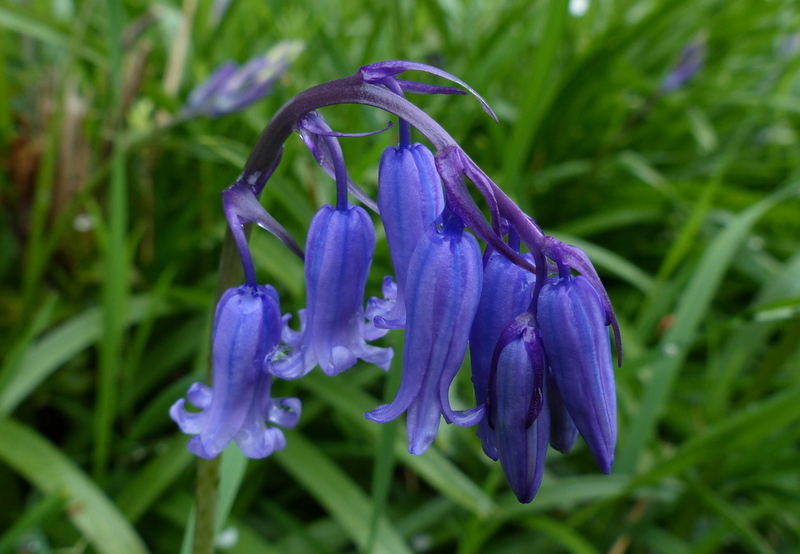 It’s rather attractive and certainly stands out well amongst the greenery. Thank you Vicki 🙂 When I was trying to choose pictures to post I just felt overwhelmed by how beautiful an animal this is. I love it if I can get that across in my post. A lovely post and I too love to be able to wrap up against the colder weather. 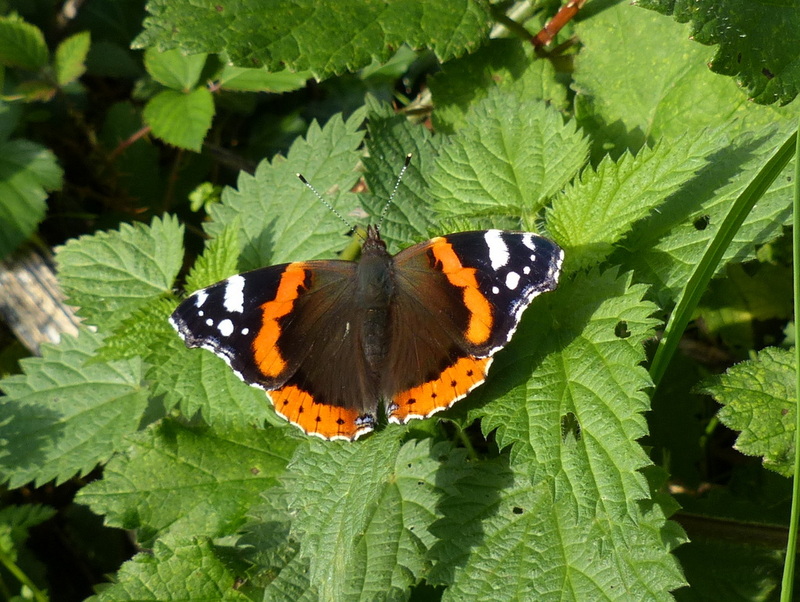 I didn’t know that Red Admirals were one time migrants, so you’ve taught me something new today. I can see what you mean about Fizz. 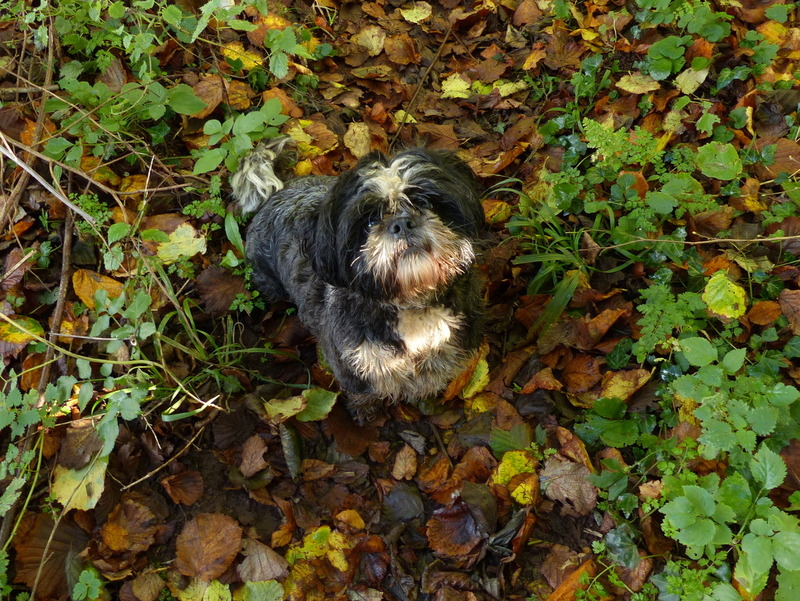 I’m no expert on dogs, but there’s something about her behaviour in the second video that rang alarm bells for me. I’d keep a close eye on her, She may not be in season at the moment, but I think it’s imminent. I know what you mean Colin. I suppose country folk have to be more detached or Daisy would never make it to the dinner plate! They are a breed unto themselves. Sometimes the things they do seem very harsh, but in order for us townies, and I’m one of them, to live amongst them I agree we have to respect their lifestyles and ways. I get on with our local gamekeeper, but I have to watch what I say. I was once praising foxes…I know, pretty dumb. He couldn’t understand where I was coming from. ” I gets a gun on it.” Was his reply. He gets a gun on everything…bless. He’s harmless enough…except when he has a gun. He does give me a heads up on where to find the deer though. He doesn’t get a gun on those. I don’t blame you for letting Fizz in for a warm. She’s adorable. I hope she doesn’t come into season…it’s hard work keeping the lovers apart. LOL! The ring of fire is beautiful and the murderous Fizz does not seem to be in season. Thank you Ibeth 🙂 That is my thinking too. Great photos, Colin. Never heard of Bonfire Day. Thanks for all the nice posts. Thank you Dennis 🙂 On this day in 1605 an honest man entered The Houses of Parliament with thirty six barrels of gunpowder concealed about his person. His plan was to blow up the House of Lords on it’s opening day Nov. 5th. Every year on the 5th English men and women light fires and set off explosives and we think of what it would have been like and what it would be like now if only we could blow them all up. 🙂 We have been doing this for a very long time and It is a big part of every English person’s childhood. Thanks for the explanation about Bonfire Day. Beautiful images of the butterfly. Now the Johnny Cash song is running through my head…. Thank you Barbara 🙂 Normally butterflies have eye spots to deflect attacks away from their important little bodies. I am not sure why this one has a bright orange circle but it is lovely and it made me think of Johnny Cash too. 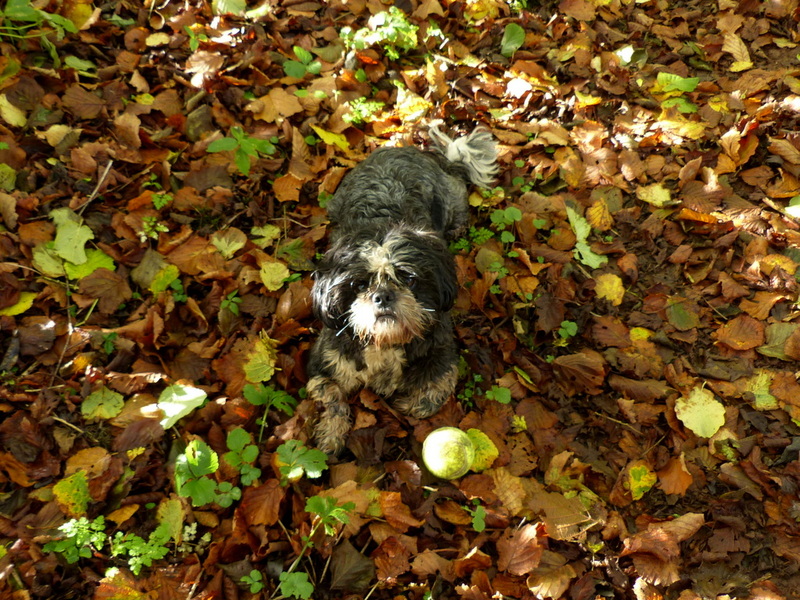 Neither of the dogs seems to think Fizz is in season, at a time when both would know. That butterfly is so pretty. Interesting that they winter over more, and that I’m picking Lima beans in November. The “ring of fire” is beautiful. I am glad to Follow…I learn….Thank you, Colin. 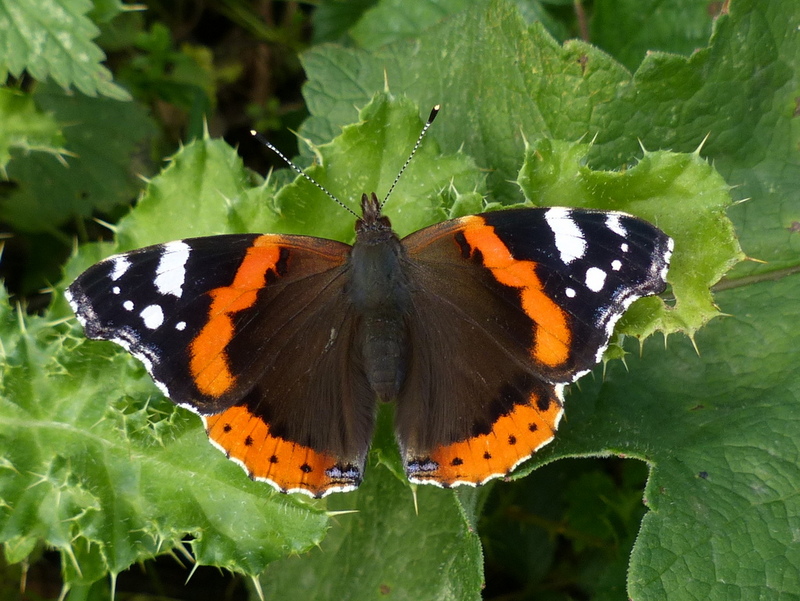 Lovely Red Admiral photos. I tried photographing them this summer but couldn’t get an open wing picture at all. Looking closely at your photos I realise that I had never noticed the little bits of blue patterning around the edge of the wings before. As Matthew said, I think Fizz is a little bit ‘flirty’ in the second film, but then of course I don’t see how she behaves with Buddy every day as you do. I am sorry your friend had that awful accident with her puppy and that you witnessed it. So very upsetting. You are a very wise man. We not only have to be gentle with ourselves but with others too, especially when they are hurting and I can see you always are gentle with others. Sometimes other people’s actions and words can be hurtful, but when we know that they have suffered recently we can forgive them as we hope to be forgiven ourselves. I am sorry you have had a hard time – nightmares are horrible and intrude on our day-time thoughts. Not sure how I missed this post. Hope the tide’s out tomorrow. Thanks for keeping me updated on the dragonfly status.